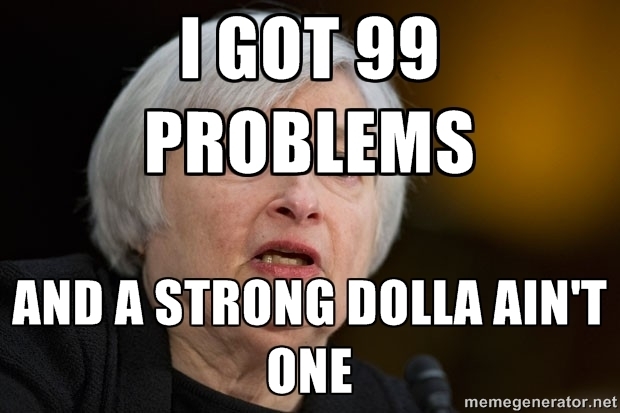 The US Economy Has 99 Problems And The Strong Dollar IS THE BIGGEST ONE! Whatever you say Janet… What ever… you say. Members of the FOMC are getting tired of answering questions about the dollar’s strength and its effect on the US economy. Each time the question is brought up, the FOMC member conjures up his or her best BS and everyone else just nods along. Now I believe they are full of it and that they know they are full of it. They are just cheerleading the economy the best they can because in truth their words are the only bullets they have left. After all, last summer, the Bank of International Settlements (BIS) which Janet Yellen is a board member of, released a report screaming about the dangers of the US dollar carry trade. Ever since the Fed printed trillions of dollars out of thin air, corporations around the world decided to borrow them to the tune of $9 trillion. As the DXY rises towards new decade highs, anyone who borrowed dollars in the last decade is now losing money and they will keep losing money as the dollar continues to rally. I’ve mentioned this multiple times on this blog, but it bears repeating because if these morons raise interest rates, they will blow up this carry trade and the global economy with it. A lot of people see similarities in the Fed’s willingness to hike rates today and when it tightened back in 1937. However, there is a big difference. Back then, the dollar was not yet the world’s reserve currency. The gold standard had just broken down at the time and the global monetary system was in flux. In today’s world, the Dollar IS the reserve currency, and when the Fed tightens it forces the whole world to tighten with it, whether its ready to or not. So I argue, that any form of tightening by the Fed will be much worse now than it was in 1937. Because let’s face it, the world is not ready for a strong dollar by any means, ESPECIALLY CHINA. China has not only pegged it’s currency to the dollar but of the $9 trillion carry trade, Chinese companies are said to have borrowed $3 trillion. So China finds itself between a rock and a hard place. Right now the strong dollar is artificially inflating the value of the Yuan and therefore hurting Chinese exports. Which means China loses competitiveness to Japan who has been able to devalue its currency by 20% against the dollar in the last year alone. If China were to devalue its currency by 20% to stay competitive then the $3 trillion those Chinese companies owe, would also increase by 20%. Good luck paying that back eh? So you’d expect a wave of defaults in China. With an over levered banking system that makes the US banks seem solvent, good luck taking that medicine. So either way China is screwed by the dollar’s rise. Perhaps this is all part of the Fed’s and by extension the US government’s plan? Cripple China before she gets too strong? To me that’s the best idea I’ve come up so far other than Ockham’s choice that the FOMC members are arrogant fools.